Perhaps some people are just not destined to be writers. Alone, perhaps while bicycling, or driving to work the most amazing ideas leap fully formed into my mind. Occasionally I try to write down notes about them, the ideas. I have even tried a dictation recorder. Or perhaps why not me. Margaret was a farmer’s wife. She had a tough life, after the death of her mother she raised her younger brothers and sisters, then married and raised her own family. I knew her from my occasional visits with relatives and when I dropped in alone during trips back home to my native southern Louisiana. Her farm house had evolved from a simple tiny shack, but was plain, clean and comfortable with the spacious kitchen needed to manage her 5 children. She had a quiet demeanor, always warm and friendly but seldom very opinionated. I spoke with her as often as I could when I visited my old home town and we talked about my life and plans, but mostly about family and farming. She was always well aware of the family news and inevitable clashes that any large clan such as mine has, but I never heard her volunteer any strong opinion or pass along any gossip; only her quiet knowing smile. About farming she often impressed me, her depth far surpassed mere daily challenges of the farm, and she understood world markets, the implications of legislation and weather. She could as easily discuss the economics of international demand as the effects of weather on local supplies. What I most remember about Margaret was her sense of quiet wisdom. I never heard a boast or brag and about family matters she could be counted on only for a reasoned, reserved and patient reply. Wisdom has many definitions; a typical one would be like this one from Dictionary.com: “The ability or result of an ability to think and act utilizing knowledge, experience, understanding, common sense, and insight”. It is more than just knowing what to do or say or when, it is also what not to say or how to say it. Certainly, with topics like this nearly infinite arguments can ensue over what exact definition should be used. There can be no exact definition of a term so widely used or a trait so often claimed. Consider these two concepts: “Wisdom” and “Knowledge”. Knowledge can be acquired by study, listening or watching. It is the sum of facts and information acquired through living and interacting with those around us or through the media. It is the product of education. Knowledge can be tested, measured, certified and licensed. We value it and reward those who get it with higher salaries and loftier positions. Diplomas on our walls attest to our completion of courses and tests, books on our shelves hint at our acquired information. Wisdom is a more difficult. It may be claimed by many, assigned to a few and hoped for by all. Wisdom requires experience; the old joke is “Wisdom comes from experience and experience comes from a lack of wisdom”. Perhaps the best example is teaching a very young child the meaning of “hot”. You can point at the oven and say “hot” all you want to but to a defiant child the experience of a placing a small hand on the oven is required to properly communicate the concept. Fortunately, this experience also communicates the importance of believing in the knowledge of the more experienced adult. So, wisdom can come from knowledge, but the best wisdom is acquired from your own observation. This is the hoped-for outcome of most science courses organized around lecture and lab. With luck students will do more than just memorize facts from lecture and the handling of potentially dangerous or visually repugnant materials might impart enough of the non-verbal experience to offset the lecture-imparted information. Knowledge is usually acquired from social interactions. We get it from reading, listening, watching and discussing. It is also cultural. We categorize and analyze it according to our relationship to it and its source. The acquisition of knowledge is a competitive activity. We strive to learn more than those around us to help us better compete in life. The choices we make for schools to attend, courses to study and the grades we strive for put us ahead in the job market and improve our sense of self worth. Diplomas and resumes are waved about at job interviews; we even choose our mates based partially on their job prospects, their monetary worth or their appearance, all of which are socially and culturally determined qualities. Most wisdom is non-social. We get it from the very hard interactions we have with the real world. Occasional near accidents wake us up to the real dangers of driving and, if they don’t result in injury they tend to improve our driving (at least for a while). Near accidents tend to focus our attention to the real dangers and risks we face. Even the wisdom we gain from our work and social interactions is not truly social; it is the experience we get from finding out that people often do things other than what they say. There is much that we learn non-verbally from our interactions with others. Body language and their tone of voice communicate (or should communicate) much to us beyond what is said. It is from our perception of the real world, our awareness and experience that we gain our ability to perceive non-verbal communications. Some people, in positions with opportunity to gain large amounts of hard experience, such as my farmer’s wife relative often possess great amounts of common sense wisdom, in spite of a lack of education or training. Many highly educated and apparently well trained people can be found with little apparent wisdom. Wisdom‘s application is most often its restraint on our behavior. The old saying “Discretion is the better part of valor” implies that the wisest action might be no action. If we competitively flaunt our knowledge restraint would be self defeating. Wisdom is the balance that keeps us from embarrassing ourselves by lapsing into bragging. Knowledge is vocal, social, competitive, often insecure, and opinionated. Knowledge is information. Wisdom is quiet, restrained, reserved, self composed, confident. Wisdom is knowing and understanding. Margaret had little to brag about in her life, aside from her family. With no degrees or formal education there was little to wave about over others. I never saw her manipulating those around her or condemning anyone’s behavior. But her knowing eyes possessed the best example of wisdom I have ever known. In recent past a popular psychology concept developed in our culture, regarding the two halves of our brains, the left and right hemispheres. Awareness and speculation on the function and importance of our two hemispheres has been extensive, and many books and articles were written about the supposed answer to many of our educational issues using this new-found information. Unfortunately, the magic answer to our problems, though it still may be found in this area, has not been resolved, mostly because, as we have learned more about this topic we have discovered: “Its complicated”. In the mid 1960s Roger W. Sperry and his graduate student Michael Gazzaniga demonstrated the different functions and specializations of the two hemispheres of the human brain. Working with severe epileptic patients the main connection between the two brain hemispheres, the corpus callosum, was surgically cut. After a period of recovery the patients were found to be fairly normal (the surgery was partially effective in controlling the epileptic secures). Following a series of careful tests and experiments it was found that within each patient had been created two separate minds, each with unique strengths and abilities; a social and linguistic left side and an intuitive, practical right side. This work led to a 1981 Nobel Peace Prize in Medicine and Physiology for Sperry. From this came a flood of enthusiastic and speculative writings on the nature of the human mind and its application to psychology and education. School curricula were re-written and pop-psychology embraced the new outlook on the human psyche. Over time the enthusiasm for this found piece of knowledge has waned and any advances made it its name were lost. The reason: “It’s complicated”. Though the concept of left brain – right brain is itself fairly simple the details complicate it. Additionally, any insight and revelation gained from our study of Left and Right must itself be understood and reported primarily by one side; our linguistic and studious left brain, while the deeper insights must be perceived by the intuition of our right side, which is very difficult to communicate without recourse to our social and linguistic left side. Hence the breadth and depth of our new discovery must be appraised and interpreted by our very non-intuitive and socially motivated side. Therein lies a complex problem; Those who should be best equipped to understand, interpret and apply this knowledge, the most educated and highly trained among us, have all been highly trained and indoctrinated through an educational process that is itself highly verbal, social and organized in a very left-hemisphere oriented system. A study of several recent psychological textbooks often shows only brief and cursory mention of the discoveries of left and right hemisphere different functions. One text book only discussed the topic for a half page. It is likely that the dual nature of our minds, the coordination and occasional dysfunction between our hemispheres that is the source of most of mankind’s troubles, and the understanding of our dual and often competing hemispheres that may hold the solution of our problems. Certainly we cannot hope to understand ourselves without a grasp of the nature and organization of our own minds; something that is sorely lacking in our present understanding. In 1968, in a small and mostly unnoticed residential community in southern California an unusual spider was found. Biologists and entomologists converged on the discovery site and identified it as a relatively dangerous species of spider with potentially toxic venom. 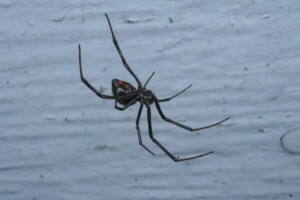 A search was made in other similar sites and other populations of this spider were found in nearby communities. Exterminators were mobilized, the original location was tented and fumigated, the public was frightened into near panic and the community gained an unwanted notoriety. A local artist even donated a statue of the spider, which was installed near the location of its first discovery. The interest soon died out, the media moved on to other stories, the statue mysteriously disappeared and most memory of the find was lost in history. In 1993 the spider was briefly thrust back into the public eye when a population was found in a basement in downtown Los Angeles, but that discovery too has been forgotten. All the better for the spiders. A walk down the street of several old downtown California shopping districts will occasionally turn up innocuous appearing spiders, hiding in corners of display windows. Within some shops, where the owners are willing to allow investigation, the same spiders can be collected from under furniture and fixtures. And the buildings where they were first found, the ones that were tented and vigorously treated? They are fine and thriving. Incidents like this create an unusual problem for a local community. Were the situation more widely known it would created a very serious economic problem for local shopping districts. No one would attend concerts in an auditorium that had a known and continuing infestation of a possibly dangerous spider. No one would shop in a store with venomous spiders lurking in the corners. No one would buy used clothing from a thrift store with dangerous spiders living nearby. Why attend a shopping district with dangerous spiders when other, uninfested districts are nearby? Who would want to work in a City Hall or attend church with toxic arachnids in the basement? On the other hand this type of information is relished by the pest control industry that can use fear of deadly spiders to drive up business. Chemical companies hire and train otherwise unqualified salesmen to give spider talks to local communities and pest control groups with the apparent purpose of inciting fear and improving pesticide sales. The answer is education. Arachnophobia is widespread and unnecessary. Black widows are extremely common and the recently introduced brown widow multiplied so much that for a while there was one every three feet along most city streets, yet actual bites are quite rare, and even those are usually ignored or assumed to be some brief flu-like illness. The best treatment for an irrational fear is familiarity and the best way to achieve that is to study and watch them in their environment. Of course the best treatment for a rational fear is simply respect, and you can have that without the irrational behavior by looking at and learning as much as you can about your fear. Southern California has its icons, most of them man-made, such as the Hollywood sign and our Observatory. But we have one spectacular feature that is entirely natural and has long been an emblem of its area and gives its name to a town: Eagle Rock, which since 1962 has been a Cultural Heritage site. Visible from the 134 Freeway, the eagle gazes into Schoal Canyon, watching over the steady lines of garbage trucks entering the dump site. 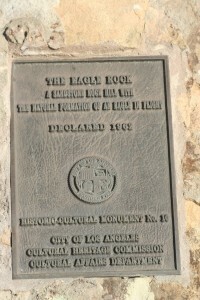 Soon, our cherished Eagle Rock will partially collapse. 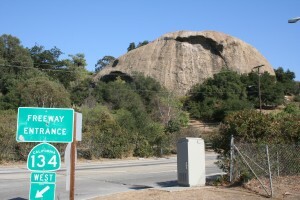 The Rock is a dome of cemented gravel and stream stones, laid down in an ancient shallow sea. Its eye was formed in the distant past by a partial collapse of a portion of the side, forming a eyebrow-like overhang. 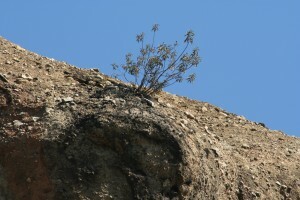 For several years a lone plant has tenuously held on, its roots eking out life among the cracks of the formation. Plants and roots do their destruction slowly, but inexorably; witness the cracks in sidewalks or the many ancient tropical temples reduced to rubble by encroaching trees. 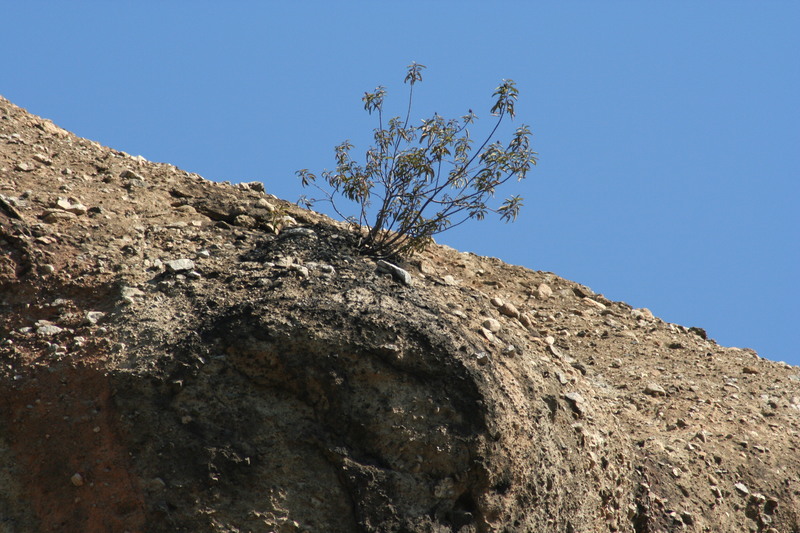 With some up-coming rainfall this plants roots will grow again, as they have done for the last few years and their crevice will enlarge, weakening the overhanging eyebrow and causing its collapse. Our eagle will become blind. Handwringing and blame pointing is a useful task. It accomplishes the purpose of making public officials appear to be actively engaged in their task of governing the populace. Proactive actions do not serve the same useful purpose. Spending public moneys on what some may consider “decorations”, while homeless go hungry and potholes damage tires appears to be a waste, that is until the true costs of the loss of a beloved icon becomes known. Millions were spent on restoration of the Hollywood sign, more on cleaning the dome of our observatory, our beloved sidewalk stars are restored and polished by crews of our public works. 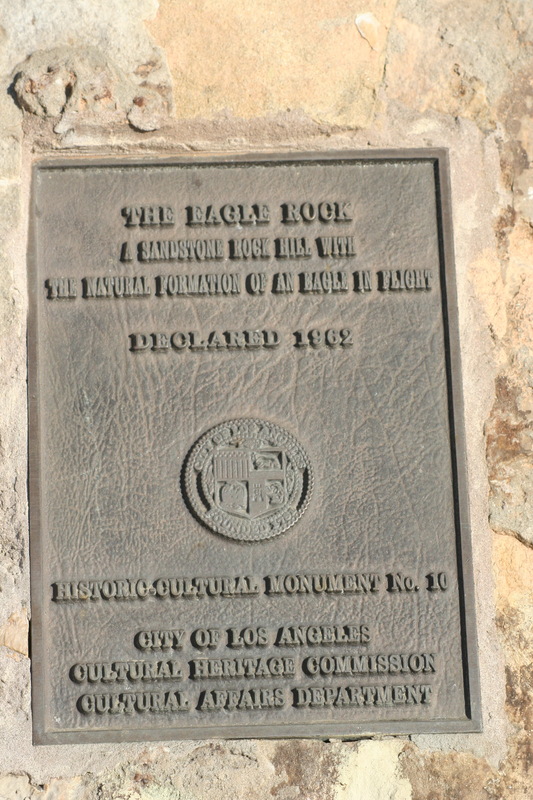 Perhaps someone should bring out the hedge clippers and save our Eagle Rock. We all have opinions, what most don’t realize is that we always have TWO. The reason is that we are each two minds, whether we realize it or not. How well we can see this determines our self control and awareness.